Three cups flour, one cup sugar, one cup milk, two tablespoonfuls butter, two teaspoonfuls cream tartar, one egg; beat all together, then add one teaspoonful soda; flavor with lemon. Bake one-half hour; serve with sauce. Sauce:—One cup butter, two cups powdered sugar beaten to a cream, two tablespoons wine, half spoonful vanilla beaten with it, half pint boiling water. There are many similar recipes in cookbooks from the 1870s onward, although the ingredient proportions and sauces varied. I tried the Godey’s recipe. It was okay, but the cake seemed a little dense, and the sauce was very rich (so much butter! ), though once it oozed into the cake it was edible. In other words, the cake and sauce really needed each other. I then made a recipe from Fannie Farmer’s 1896 Boston Cooking-School Cook Book. Standardized measurements had been introduced in the 1880s, but this book was the first to use level measurements (readers were instructed to slide a knife across the tops of cups and spoons). Fannie Farmer also provided information about nutrition, food composition, and culinary techniques, and she chose appealing recipes. Her book was an immediate bestseller. 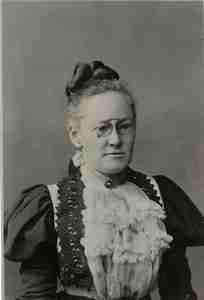 The photo below is of Farmer in her early 40s, when she was head of the Boston Cooking School. Farmer’s vanilla sauce contained cornstarch as a thickener, and I made it but didn’t like its gelatinous texture. So I looked through the 19 other pudding sauces in her book (pudding was huge in those days!) and opted for a simple lemon sauce. I glazed the cake with about half of this, and served some strawberry sauce alongside it, to make my ten year old happy. This is the wrong time of year to buy strawberries in New York — I tried, and crushing them was like trying to mash rubber. So instead I used thawed frozen strawberries preserved in a sugar syrup. We all liked Fannie Farmer’s cottage pudding. It was sufficiently airy and soaked up the sauces beautifully. This was good comfort food, just right for a cold snowy day (which we’re having, again). I only wish I were baking it in a cottage instead of a high-rise. The current edition of The Fannie Farmer Cookbook, edited by Marion Cunningham, still has a recipe for cottage pudding, but it’s altered substantially from the 1896 edition, with twice as much butter, less flour, and half the amount of milk. It’s also now called “Cottage Pudding Cake.” But I’m sticking with the old version. Here is my adaptation — the ingredients are the same, but I’ve given a few more directions. 1. Preheat oven to 375°F. Butter an 8 X 8-inch square baking pan. In a large bowl, cream the butter briefly, then gradually add the sugar and beat well. Beat the egg, then add it to the butter-sugar mixture and blend well. 2. In a medium bowl, whisk the flour, baking powder, and salt thoroughly to blend. Add this mixture to the butter-sugar mixture alternately with the milk, in three parts, blending well after each addition. 3. 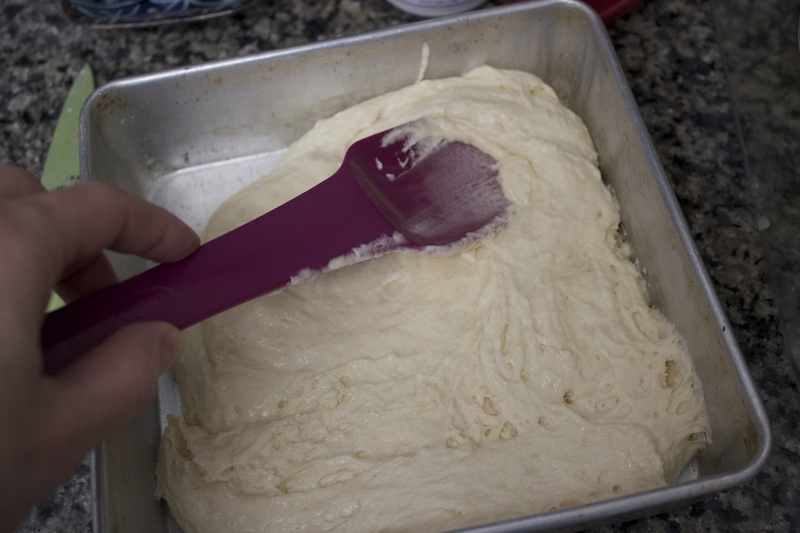 Pour batter into the prepared pan, and use a spatula to spread it evenly. 4. Bake cake for 25-30 minutes, until a toothpick inserted in the center comes out clean. Let rest for 15 minutes. Serve warm or at room temperature with lemon sauce (see recipe below) and/or strawberry sauce. This entry was posted in cake, dessert and tagged 19th century food, Boston Cooking-School Cook Book, Fannie Farmer, food history, Godey's Lady's Book, lemon sauce, pudding, strawberry sauce by revolutionarypie. Bookmark the permalink. I was so intrigued by this I had to seek out British predecessors… One possible recipe is for Sunderland Pudding (otherwise known as Castle Pudding) described in Eliza Acton’s 1845 book (2nd ed.) called “Modern Cookery”. There is also an American edition of Acton dating to 1858 which includes this recipe. The cake is described as a type of pound cake served with a wine sauce. The sauce is described in the book as well (in an earlier chapter) – listed as a “Common Pudding Sauce” which is essentially wine, butter and sugar. Interesting! Really love the miscellaneous information you can get from the Godey’s Lady’s Book – many of which are available through the Internet Archive. I was wondering about British predecessors. I think you’re right about the Sunderland pudding. Cottage pudding seems similar but with chemical leaveners instead of so many eggs. And I don’t think Sunderland had sugar in the batter, right? Sorry, it looks like the insert image hasn’t worked. Yes, Acton’s recipe for the cake part does contain sugar – in fact, it is equal weight of eggs, butter, flour and sugar and a pinch of salt. She also says it can be flavoured with grated lemon or with a bit of mace. Then baked. There does not appear to be any leavening agents other than the egg. The wine sauce is a quarter pint melted butter (i.e. imperial pint – therefore 5 fluid oz.) with 1 and 1/2 oz. sugar, plus a “couple” glasses wine (i.e. unmeasured amount) – boiled until syrupy. This is poured over the cake. Wow, that sounds a lot like the Godey’s recipe. Thanks so much! Just looked up a few older versions of Sunderland pudding and you are right, there is no sugar listed in the cake part. It originated in Britain, but it looks like the recipe was available in the Colonies/early US in the 18th century. Thanks for all the research. One of these days I’ll try making Sunderland pudding, though I think I’m moving on to fruit fools next. Thanks for another interesting post! I love it when British people call dessert “pudding.” 🙂 That is a lot of butter in Godey’s sauce recipe. Your adaptation sounds just right. I was intrigued also, and looked at my 1921 “Homemaker’s Cooking School Cook Book”. Their Cottage Pudding is totally different, as you start with two cups of firm fruit (“sliced apples, peaches, cherries, etc.”) heat them, and then pour over the fruit a batter of 3/4 C sugar, 3 Tablespoons melted butter, 1 cup milk, 3 tsps baking powder, 1 egg and 2 1/2 Cups flour. Ahh, the endless varieties that can be made with tiny tweaks! I noticed a few other recipes like that, from the early 20th century. It’s sort of surprising they were still called cottage pudding! 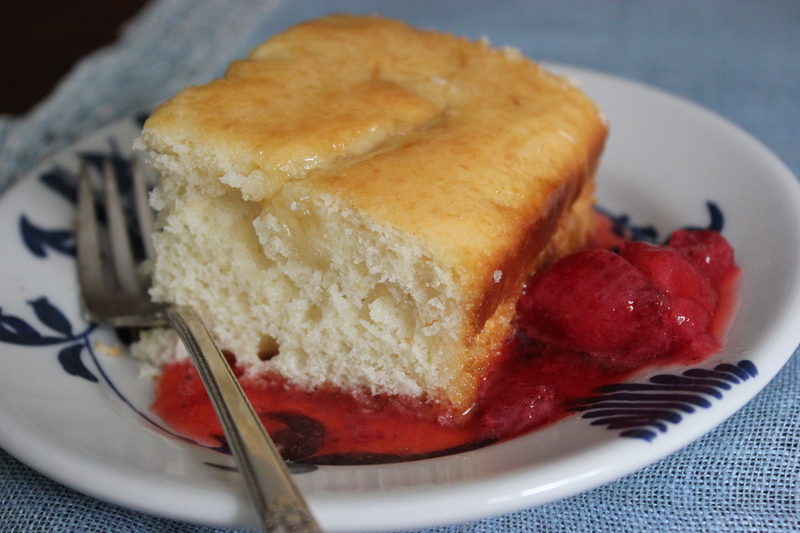 I have just picked rhubarb from the garden .. will make this ‘pudding cake’ today with rhubarb sauce. Also, I have some lemon curd & fresh farm cream to whip up in addition. Can’t wait. Hope it turns out well. What a great combination!